Diabetes is a metabolic disorder, the prevalence of which in the developed world has reached epidemic proportions. It has led to significant reductions not only to an individual’s quality of life but also their expectancy and places a significant economic burden on health care systems across the global. Clinical studies have shown that the classical diagnostic markers of blood glucose and glycated hemoglobin (HbA1c) are insufficient to predict the development of diabetic complications, and in the long-term, reduction of individual’s blood sugar cannot prevent the development and progression of late diabetic complications, with some individuals still developing complication despite normalization of their glucose status. 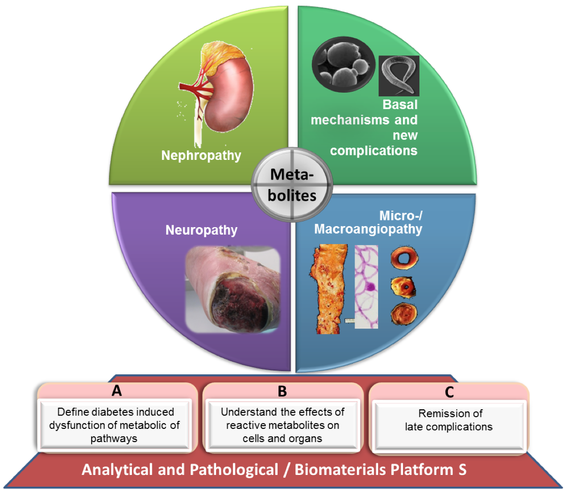 Recently, it has been shown that reactive metabolites, such as reactive oxygen/carbonyl species (ROS/RCS), and the subsequent formation of post-translational modified proteins can be better diagnostic markers for predicting the development diabetic complications. Increased formation of posttranslational modified proteins can lead to a change in the function of a single protein or via activation of signal cascades, to functional impairment of an entire organ. The balance between the production and detoxification reactive metabolites and they related post-translational modifications, may therefore provide a new concept for understanding how diabetic complications can develop independent of glucose. Preliminary work from various model systems supports this hypothesis and suggests that manipulation of this balance can help to prevent the development of late diabetic complications and improve the life expectancy individuals with this debilitating disease. It is therefore imperative to better understand the factors that regulate and influence this balance so that suitable therapeutic strategies can be developed. Aim 1: To identify and describe those pathways that are dysregulated in diabetes and lead to increased formation and accumulation of reactive metabolites and associated post-translational modifications (A-projects) . Aim 2: To determine the mechanism of action of reactive metabolites in the development and progression of later diabetic complications (B-projects). Aim 3: To identify pathways controlled which can reduce or prevent the formation, accumulation and subsequent biological consequences of reactive metabolites and associated post-translational modifications in diabetes (C-projects).